India - a Tourists paradise: Astronomy - When and How Did the Moon Form? Astronomy - When and How Did the Moon Form? New studies offer contrasting scenarios for making the Moon. One argues for a one big splat early in solar-system history; a second envisions a score of lesser blows that built up the Moon over time; and a third suggests water was involved. Given the trove of lunar samples in hand and the power of modern laboratory analyses, you'd think that by now geochemists should have completely nailed exactly how the Moon formed. But not so — in fact, there's still lots of debate on how Earth formed. Artwork of a Mars-sized object colliding into the Earth early in solar system history. Many planetary scientists believe that an impact such as this threw off the debris which eventually formed the Moon. Here's the basic problem: about 30 years ago, dynamicists showed that a body roughly the mass of Mars could have struck Earth a glancing blow and ejected enough debris into orbit to collect into a Moon-size object. In virtually all of those simulations, most of what ends up in the Moon came from the impactor rather than from Earth. But the Apollo (and Luna) lunar samples, not to mention lunar meteorites, show that the Moon and Earth have very similar compositions. Apart from their lack of iron and extreme lack of water, Moon rocks match Earth's isotopic ratios for the geochemically diagnostic elements titanium, calcium, silicon, and (especially) oxygen and tungsten. This really pins the dynamicists in a corner — only in rare cases, 1% or 2% of the time, do their simulations yield a Moon with an Earthlike composition. There's also a problem of fine-tuning the impact to yield the angular momentum of the current Earth-Moon system. I've written about possible solutions to these conundrums (or is it "conundra"?) here and here, but no one idea checks all the boxes. One can imagine that the giant impactor and proto-Earth had nearly identical compositions — but statistically and intuitively that seems unlikely. In January 9th's Nature Geoscience, Israeli researchers Raluca Rufu, Oded Aharonson, and Hagai Perets argue that the notion of a single, giant impact is wrong. Instead, they propose that Earth endured dozens of lesser (but still potent) impacts with object ranging from 1% to 10% of its mass, each of which ejected debris into an orbiting disk. The rings quickly coagulated into moonlets, and tidal interactions with the young, mostly molten Earth then drove each of them outward. Over time they accumulated into the Moon. According to simulations by three Israeli researchers, the Moon might have assembled over time from the debris of 20 or more individual impacts with Earth. Nature Geoscience / R. Rufu et al. This approach yields a lunar composition that's an amalgam of many compositions, which eases the unyielding isotopic constraints. The most Earth-like contributions came from nearly head-on collisions that drilled deeply into our planet's mantle. A couple of glancing blows late in the process could have tweaked the system's angular momentum to match what exists now. As Gareth Collins (Imperial College, London) notes in an accompanying News & Views perspective, "Lower-energy moonlet-forming impacts would leave parts of Earth unscathed. Distinct, terrestrial geochemical reservoirs may therefore have survived Moon formation." And, indeed, researchers have identified portions of Earth's mantle that are compositional mismatches to the rest of our planet. Making the Moon: Slow or Fast? The piecemeal assembly envisioned by the Israeli team would have taken a long time, perhaps even 100 million years — and that opens up another aspect of the lunar-formation debate. Some planetary scientists have indeed argued, mostly on geochemical grounds, that the Moon might have formed 150 to 200 million years after the beginning of the solar system. Others claim it showed up much sooner, within a few tens of millions of years. 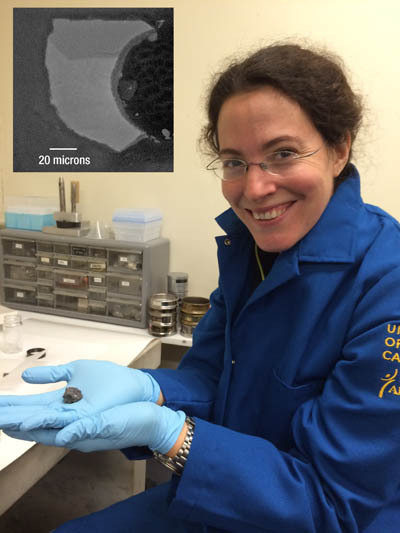 Researcher Mélanie Barboni holds a lunar sample prior to crushing it to extract zircon grains like the one in the inset. Another new analysis, published January 11th in Science Advances, maintains that the Moon came together in a hurry and had mostly solidified by 4.51 billion years ago, or 60 million years after the solar system's birth. The evidence, say Mélanie Barboni (University of California, Los Angeles) and six colleagues, is found in eight tiny grains of the mineral zircon (ZrSiO4), collected by Apollo 14's astronauts, in which they found traces of uranium, lead, and hafnium used for isotopic age-dating. Several years ago a different research group had analyzed these same grains, and it also came up with an early formation age. But that result had wide uncertainties, owing to the techniques used. Barboni's team redid the age-dating, carefully measuring the lead isotopes that resulted from the radioactive decay of uranium-235 and -238 and also assaying the decay of lutetium to hafnium. Finally, the researchers also corrected for the lunar samples' exposure to cosmic rays, which can bias the isotopic ratios. They feel the resulting age of 4.51 billion years has an uncertainty of no more than 10 million years — and that the Moon might actually be older. More pointedly, the Apollo 14 zircon grains presumably crystallized from the deep lunar magma ocean (LMO) that existed right after the Moon came together. 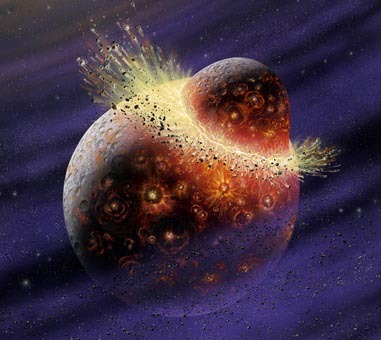 This would have happened if the Moon assembled as white-hot debris after a single, catastrophic impact with Earth — but it's less likely if dozens of little cooled-off moonlets coagulated into a single whole. As if the How and When of the Moon's formation weren't complicated enough, a third new analysis argues that — despite its extreme dryness today — the Moon likely contained a lot of water when it formed. In the same issue of Nature Geoscience, Yanhao Lin (Vrije Universiteit Amsterdam) and three others describe their experimental attempts to mimic how the Moon's magma ocean solidified. Lower density minerals would have floated to the top, forming a crust. They find that the suite of minerals found in the lunar crust today — combined with its thickness — argue that water was part of the mix at a concentration of 270 to 1,650 ppm. This might not seem like much — but if proven true there'd be significant implications. "A wet start of the Moon, coupled with the strong similarities between the composition of the Moon and the composition of the silicate Earth," Lin's team concludes, "suggests that equally high concentrations of water were present in the Earth at the time of the Moon-forming event."